PetFirst Insurance started as a small 2 person company in 2004 and has since developed into the fastest growing pet insurance company in North America. The company’s goal is to provide solutions to every pet owner by offering the best policies in the industry and working with customers to know exactly what they want. Their unlimited lifetime coverage and great add-on packages means that they will be able to cover all of your pet’s needs, and all of your own financial worries. PetFirst is an ideal pet insurance for owners of a multi animal household who want comprehensive coverage. Especially good for senior pets. PetFirst has only one lifetime coverage plan that provides the same coverage but differs in it's annual limits of $2,000 and $5,000. These annual limits are low compared to their competitors and pricing is a bit more than competitors, but where PetFirst shines, is in the comprehensive coverage. They are one of the only insurers to cover bi-lateral conditions – which is is a medical condition that can happen on both sides of the body. Normally if a pet has been diagnosed with a bi-lateral condition, the insurer will not cover any issues that arise on the untreated side. While many insurers say they cover “Alternative therapies”, many also state they don't cover “holistic” treatments – Petfirst covers both. Other areas where they separate themselves from other insurers include coverage for unlimited foreign body ingestions per year, Dermatological Conditions, Aging Pet Ear & Eye Conditions, coverage for Experimental & Investigational Treatments, and they also cover periodontal disease. The Periodontal disease coverage again is especially helpful for owners of senior pets – as any senior pet owner will attest to. Prices are based on geographic location, breed, size of dog, age, deductible chosen, reimbursement level chosen and annual limit. For a medium sized mixed breed 2 year old dog from Minnesota the price averages about $29.95 for a $250 per incident deductible, 80% reimbursement, and $5,000 annual limit. For a domestic short-haired, 2 year old cat from Minnesota the price averages about $17.95 for a $250 per incident deductible, 80% reimbursement, and $5,000 annual limit. All plans provide guaranteed lifetime coverage for accidents and illness, plus other common pet diseases. Petfirst offers multiple discounts for purchasing via the internet ($10 or $20), military (5%), animal care employees (10%), and multiple pet discounts of 5% discount on your second policy, and a 10% discount on your third policy and beyond. These discounts can be combined. You also get a 14 Day Money Back Guarantee. PetFirst requires a 14 day waiting period for illness, however accident coverage begins the day after you register. There is also a 12 month waiting period for cruciate ligaments and disc disease. No additional wait period on hip dysplasia, patella luxations or orthapedic conditions. With PetFirst you can visit any licensed veterinarian in the United States. PetFirst does not offer coverage for your pet if travelling outside the U.S. Routine wellness checkups, spaying or neutering, vaccinations, removal and preventive treatments of fleas/lice/heartworm are also excluded unless you have bought an optional add-on rider. Routine dental cleanings are not covered, but they do cover the treatment of periodontal disease. PetFirst gives options for per incident deductible amounts of $50, $100, $250, $500. They also offer reimbursement levels of 70%, 80%, and 90%. PetFirst Insurance has no per-incident or per-lifetime limits. However they do have annual limits of $2,000 and $5,000. The annual limits depend on which plan you get. It will take PetFirst around 10-15 days to process your claim once it has been submitted. Reimbursement checks will arrive by mail within 10 business days of your claim being successfully processed. 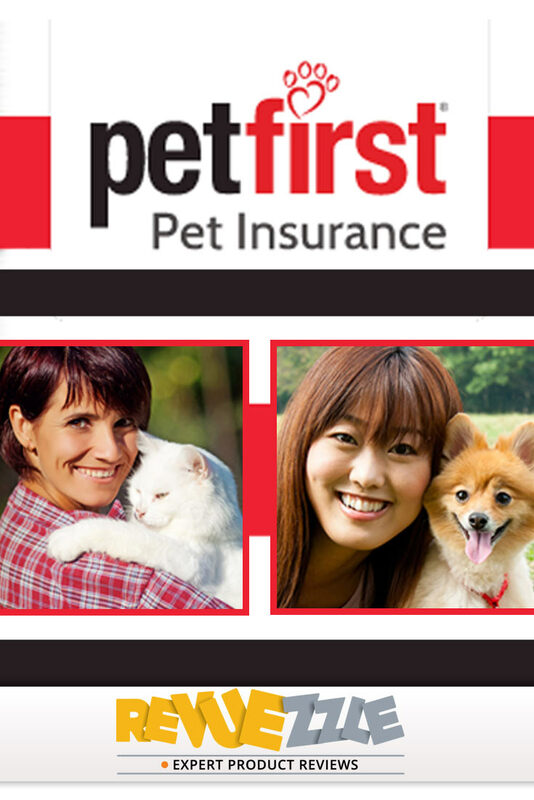 PetFirst Insurance provides discounts for owners of multiple pets. Customers who enroll in their family plan save on average 30%! You are also given the option of adding 3 different routine care packages to your coverage if you wish. These packages cover things such as vaccinations, exams, microchipping and training. 1. Routine Care 125: Provides up to $125 in reimbursement for for $8/month. 3. Routine Care 400: Provides up to $400 in reimbursement for $22/month. PetFirst has a great website that allows you to learn all about their plans and everything they provide for you and your pet. At the click of a button you can receive a quote for your pet and then register and start receiving coverage. PetFirst is available Monday through Friday from 8am-9pm EST, or Saturdays from 10am-6pm EST. They can be contacted through e-mail at info@petfirst.com or by phone at 1-866-937-7387. PetFirst Insurance also allows you to view the details of your policy, monitor the status of your claims, and update your billing information all online through your account on their website. Pricing depends on breed, age, size, whether your pet is spayed or neutered, and the deductible and reimbursement level. Prices can vary greatly because of all these factors, but an average estimate would be $28/month for small dogs, $30/month for medium sized dogs, and $36/month for large dogs. As well, the average monthly price for cat owners is around $18. *Sample costs based on a 2 year old mixed breed from Minnesota with a $250 per incident deductible, 80% reimbursement level, and $5,000 annual limit. PetFirst gives customers the choice of paying either monthly or annually. Those who pay annually get a slight discount. There is no upper age limit, and pets as young as 8 weeks can enroll with PetFirst. PetFirst offers routine care add-ons that cover general wellness. PetFirst is designed to cover accidents and illness. PetFirst will not increase your premium as a result of making claims. There are no per-incident or per-lifetime limits when insured by PetFirst. They have annual limits of $2,000, $5,000, $10,000 and $20,000, depending on which plan you have. Alternative care and congenital conditions are covered. Hip dysplasia is also covered as long as it is not a pre-existing condition. Cancer treatments, Holistic & alternative therapy coverage, and coverage for vaccinatable diseases like canine influenza, parvo and kennel cough are also covered. They are one of the only insurers to provide coverage for bi-lateral conditions. PetFirst also provides an optional routine care package that covers wellness and preventative care. Pricing Based on: 2 yr old female medium sized mixed breed dog from Minnesota or 2 yr old female domestic short-haired cat from Minnesota with $250 per incident deductible, 80% reimbursement, and $5,000 annual limit. PetFirst is perfect for owners of multiple animals who want all of them to be insured and have guaranteed coverage for the rest of their life. Most pet insurance companies require a 14 day waiting period after registration for both accident and illness. While PetFirst also has a 14 waiting period for illness, their coverage for accidents begins within 1 day of registration. This means you do not have to worry about lacking coverage should anything happen shortly after you register. Many people own multiple pets, and providing insurance for all of them can amount to a small fortune. 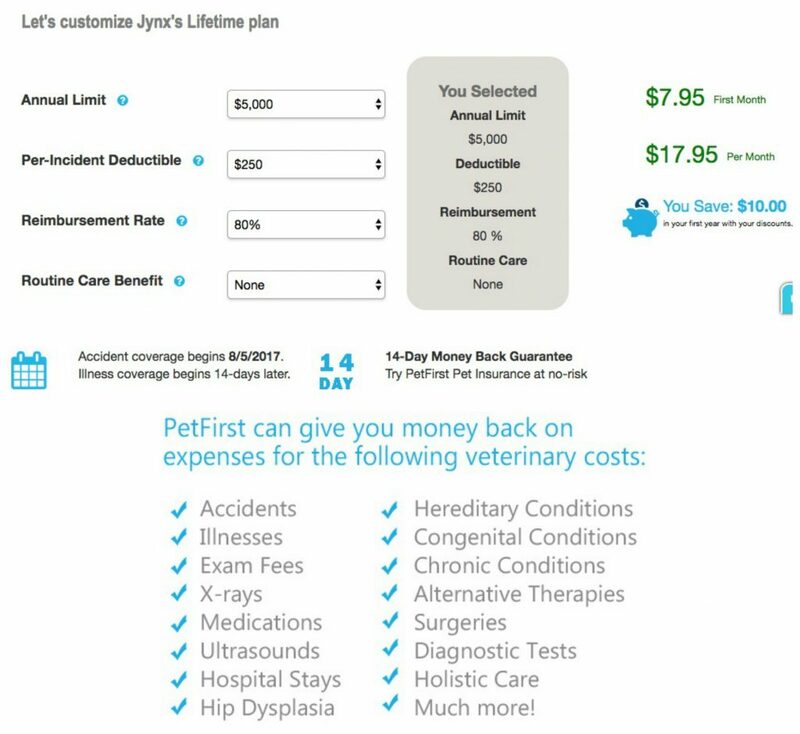 PetFirst is unique in allowing customers to purchase a family plan to insure multiple pets, and the fact that users save 30% of the average cost helps relieve the financial stress they would normally face. PetFirst also gives discounts to customers who choose to pay on a yearly rather than a monthly basis. This is just another way that PetFirst helps owners save on the cost of pet insurance. The three optional add-ons that PetFirst provides which cover routine care are perfect for any owner who wants to be able to budget for their vet bills. They cover an extensive range of services and are one of the best options for add-ons in the industry. Unlike other pet insurance companies that pay the vet directly or reimburse customers through direct deposit, PetFirst sends customers reimbursement checks through the mail. This means customers have to wait much longer to get the money they deserve. 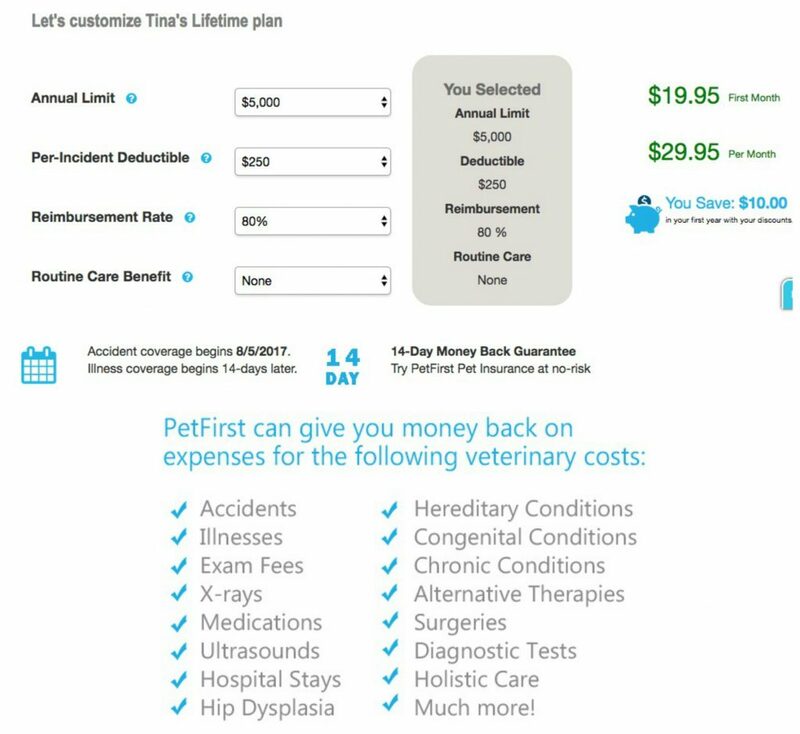 The lowest plan that PetFirst offers is a very reasonable $37/month, but it comes with a low annual limit of $5,000. On the other hand, their top plan has a high annual limit of $20,000, but comes at the price of $107/month. This is unfortunate because it forces owners to choose between affordability and coverage. Like all other pet insurance companies, pre-existing conditions are not covered with PetFirst. While this practice is understandable, it is unfortunate because it excludes older animals that have already had health problems from receiving coverage. PetFirst offers the best options for families looking to insure more than one pet. The discounted family packages offer much more affordable care than the alternative of insuring each pet individually. Unfortunately, even with the great add-on packages and unlimited lifetime coverage that they offer, their main plans are not as competitive as those offered by other companies. Nevertheless, with their great customer service, and continued growth, you can be sure that your investment with PetFirst will be well worth it. An insurer for multi-pet households. PetFirst is an ideal pet insurance for owners of a multi animal household who want the shortest waiting periods, affordable coverage, and protection from unexpected veterinary costs. Pricing depends on breed, age, size, whether your pet is spayed or neutered, and the deductible, annual limit, and reimbursement level you choose. Average price would be $28/month for small dogs, $30/month for medium sized dogs, and $36/month for large dogs. Average monthly price for cat owners is around $18. $28.00 Get Your Free Quote! Got more than one furry friend? PetFirst offers multi-pet discounts!